You’ll be familiar with the phrase ‘so many books, so little time’. This is one of these times where the book sounds wonderful but I just didn’t have the time to read it. Instead I bring you a guest post from the author, Sylvia Colley – a guest post which seems may have had her reaching for a stiff drink! When I hear the word ‘BLOG’ I reach for the whiskey bottle! I have never written a blog and I think, ’Who on earth would be interested in anything about me?’ I love talking and writing but not about myself. Unfortunately, I write what might pretentiously be called literary novels. I wish I could instead write a really funny autobiography or a who dunnit or an ‘adults can enjoy as well’ children’s book like the children’s writer, Ian Whybrow, does. I suppose I have to try to be serious and say the obvious which is that all artists are trying to express something about themselves even if they don’t know it, and are trying to make sense of their reality. And to communicate. Ah! But there’s the rub, as somebody in Shakespeare probably said. My first novel, LIGHTS ON DARK WATER, explored what it might be like for someone with low self-esteem to love and lose; to feel lonely; to be bullied at work. It’s a journey, often dark, but the hope comes unexpectedly. Good things often do. 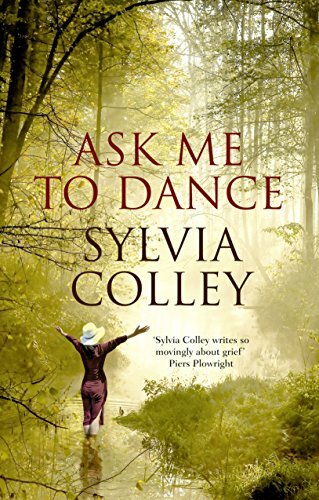 My second, ASK ME TO DANCE, follows over a few days, a traumatised woman who goes on a retreat to a monastery. The experience is not at all what she had hoped for. She is alone a great deal. Everyone is too busy or disinterested to bother with her, apart from an old, rather grubby, simple-minded monk with whom she unexpectedly bonds. But all is not well and, in the end, her repressed anger bursts out, without warning, in an act of violence. You see what interests me and what I try to explore is the masks we wear to hide behind; our powerlessness against the slings and arrows etc and how characters react in so many different ways; how what happens to us in childhood can affect how we are as adults. As they say; ‘There’s nothing new under the sun’! But you have to do what you have to do. I could have written many books, perhaps even been famous by now! but I chose love and children before my writing. Being loved was all important to me then. And I couldn’t do both because I had to earn money, which I did as an (don’t be surprised) English teacher! I can’t change the world but perhaps, if just one reader is uplifted by my work, it will all have been worthwhile. Now, where’s that whiskey bottle? I’m worth it. Isn’t that what they say? Rose Gregory has suffered a devastating blow, a double bereavement from which months later she is still reeling. Sanctuary and rest are prescribed by her doctor. But when she arrives at her refuge, a dank and decaying Monastery, she finds it is not the haven promised. Despite the veneer of calm contemplation, the Monastery turns out to be a hotbed of intrigue and disharmony. Rose witnesses bullying and cruelty and ultimately in defence of the vulnerable turns to violence herself. Sylvia Colley’s extraordinary understanding of a woman’s struggle to deal with grief, the denial, the anger, the loneliness, is described without sentimentality. A beautifully written and moving story. ABOUT THE AUTHOR: Sylvia Colley was born in Romsey, Hampshire. She became a teacher and spent many years as Head of English at the Purcell School in North London. She has published a book of poetry, It’s Not What I Wanted Though, and a novel, Lights on Dark Water. Her work has been read on BBC Radio 4. She lives in Pinner, Middlesex.